Ahtanum boasts a floral bouquet matched with citrus essence. The high amounts of both myrcene and caryophyllene both contribute to the sweet and slightly spicy, or peppery character of this American hop variety. The Amarillo variety was discovered by Virgil Gamache Farms Inc. in one of their hop yards in Washington State and propagated and introduced by them as Amarillo. 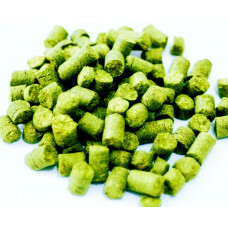 Unlike most varieties of hops, which may be acquired and propagated by the purchase of rhizomes, Amarillo hops are privately grown only by Virgil Gamache Farms; also the organization holds a trademark on the name "Amarillo" for hops. Brewers Gold is a complex bittering hop that is noted to have a sharp or pungent bittering quality. It also imparts a fruity yet spicy aroma as well as having a black currant characteristic. It is on the low end of the bittering hop scale at 8 to 10% AAU typically. Brewers Gold can be used in a wide range of styles from English Ales to German Lagers and adds a decidely 'European' element to the beer. These make a good partner to noble varieties such as Tettnang and Hallertauer. US Cascade has a pleasant, flowery and spicy, citrus-like quality with a slight grapefruit characteristic. The hop is good for both flavor and aroma uses. It can also be used for bittering effectively, and can be used to make any ales, and indeed is characteristic of American Pale Ales; used in some Lagers. Chinook is a bittering variety with aroma characteristics. A high alpha acid hop with a wonderful herbal, almost smoky character when used as an aromatic during the last few minutes of the boil when dry hopping. Citra Brand hops have fairly high alpha acids and total oil contents with a low percentage of cohumulone content. Citra Brand hops imparts interesting citrus and tropical fruit characters to beer. A high yielding, high alpha acid American bittering hop. Also known by the trade name Tomahawk. Columbus has a very high amount of total oils, and can impart a 'resiny' quality to a beer. Substitutes for bittering: Nugget, Chinook. Substitutes for aroma and flavor: Cascade, Centennial. Comet hops have been around since the 1970's and are a cross-breed of British and wild American hops. Flavour aromas such as citrus, herbal and earthy elements, and marijuana. An American triploid variety developed from Hallertau, Cascade, Brewer's Gold and Early Green. It is spicier than Hallertau (cinnamon, black pepper, and nutmeg).